Before the 1550s, it was generally believed that people who are born deaf are incapable of learning a natural language such as Spanish or English. This belief was nourished by the observation that hearing children normally acquire their speaking skills without explicit instruction, and that learning to read usually proceeds by first connecting individual letters to individual speech sounds, pronouncing them one by one, before a whole word is read and understood. Accordingly, it seemed obvious to many that, in the authoritative words of Aristotle, “written marks (are) symbols of spoken sounds.” Thus, for deaf children the road to learning a language like English seemed to be blocked forever. Acquiring speech by listening and imitating was obviously impossible. Written communication seemed equally unattainable, for if what is primarily signified by written letters (speech sounds) is not accessible to a person, there is no way such a person could learn to read. In the 1550s, a Benedictine monk in northern Spain showed that this belief is untenable. His name was Pedro Ponce de Leon. He succeeded in teaching reading, writing, and, most spectacularly, speaking to a number of profoundly deaf children. Ponce defied the view that written language primarily symbolizes speech, as he taught his pupils first to read and write, without reference to speech sounds, “indicating with his finger the things that were signified to them by characters.” It was only at the next stage that he started teaching speech, “prompting them to make the movements of the tongue corresponding to the characters.” He thus showed that “just as it is better for hearing people to start with speech, so for those who have their ears blocked it is better to start with writing,” as the medical writer Valles put it in De sacra philosophia. Other teachers followed in Ponce’s footsteps, but initially the practice was confined to Spain. In the seventeenth century, teaching language to deaf people became a topic of interest in Britain: in the 1660s, several members of the newly founded Royal Society acted as teachers of deaf pupils. These were William Holder and John Wallis, who both saw such teaching as an experiment corroborating their phonetic theories. 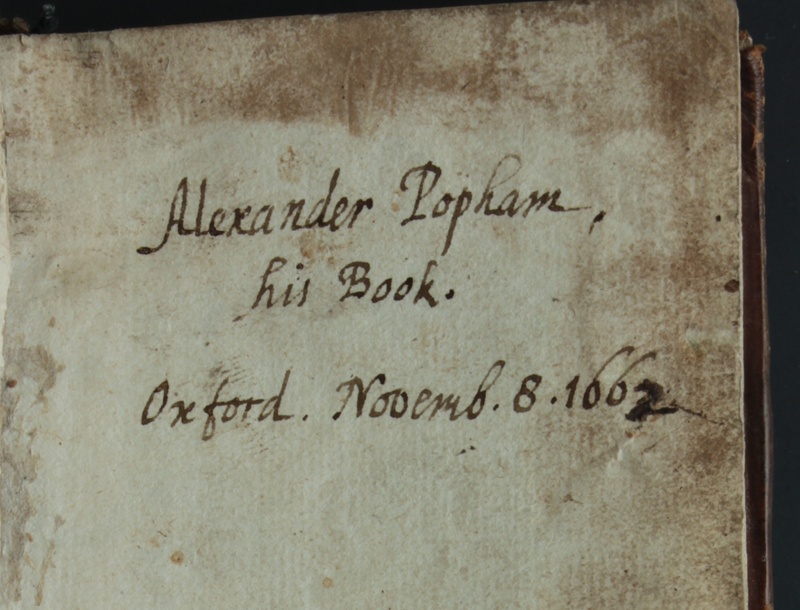 They became embroiled in a dispute about who was most successful in teaching Alexander Popham, a boy born deaf. Although Alexander’s speaking skills were at the centre of the dispute, it is clear that reading and writing also formed an important part of his instruction. Image credit: Title page of the notebook used by Wallis to teach Popham. Not all those concerned with teaching language to the deaf agreed that speech should be included. A radical position in this regard was taken by George Dalgarno, the author of an artificial language meant for universal use and claimed to be more logical than existing languages. Dalgarno’s project was part of a movement that was partly inspired by a growing awareness of the variety of possible notational systems. In particular, when scholars learned about Chinese script, it became clear that written language was not necessarily tied to speech sounds. Chinese characters were seen as so-called “real characters,” that referred to things rather than to words. In this respect, they were like Arabic numerals, and chemical or astronomical symbols. Since symbols of this type can be associated with different words in different languages, they seemed to open the way to the creation of a universal writing system. Just as the symbol “4” refers universally to the number called differently in different languages (“four,” “quatre,” etc. ), so could symbols referring to all things be contrived, or so it was believed, in order to generate a universal script. In pursuance of such a “universal character” Dalgarno eventually produced his artificial language. By the time he published it, he no longer intended his invention to be a universal writing system only, but a language that could be spoken as well as written. This aspect of his project was seen as a flaw by his critics, who considered a universal writing system as a useful invention for international communication, but saw an artificial language as rather an additional obstacle to it. Dalgarno wrote at great length explaining why this view was mistaken. The circumstance that he used the Latin alphabet, and that his language could thus be pronounced, did not detract from the fact that the written form of his language could function as a free-standing system, unconnected to speech. In the 1660s, the distinction between “real characters,” i.e. non-phonetic writing, representing “things,” and “vocal characters,” i.e., phonetic writing, representing spoken words, was well-established. For Dalgarno, however, the question whether a certain piece of writing was “real” or “vocal” could not be decided on the basis of its intrinsic characteristics. Rather, it depended on the use made of it. If one chose to disregard pronunciation, his language, or any other written language for that matter, could function as a real character! When Dalgarno formulated this insight in reply to his critics, he stated, probably unknowingly, a view that had guided Pedro Ponce a century earlier in his teaching of deaf children, connecting objects directly with written words. Dalgarno eventually saw the implications of this view for the education of the deaf. In a tract on the subject published in 1680 (‘The Deaf and Dumb Man’s Tutor”), he explained that it was best to make full use of the potential of alphabetically written language. He envisaged the use of a finger alphabet, which worked by associating parts of the fingers with letters. 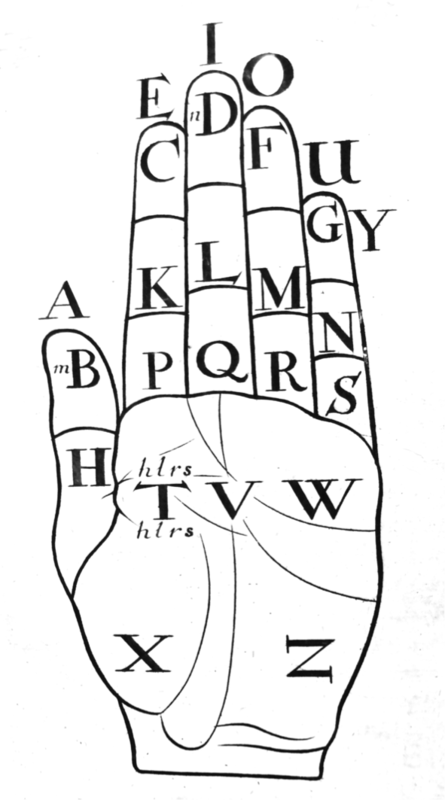 Image credit: Dalgarno’s finger alphabet. If deaf people were trained from the cradle in the use of this alphabet, he believed, this visual system would become as natural to them as audible words are to hearing children. Dalgarno did not discuss the teaching of speech to the deaf, probably because he believed that a better, visual alternative was available. However, his visual communication system was tied to languages such as English and completely different from sign language. Featured image credit: “Letter2” by Thomas Misnyovszki. CC-BY-2.0 via Flickr. John Wallis (1618-1703) was a founder member of the Royal Society, a mathematician and pioneer of calculus, and a linguist whose work included the groundbreaking tract on phonetics, De Loquela (1653). David Cram is an Emeritus Fellow of Jesus College, formerly Senior Research Fellow and Lecturer in Linguistics. By background and training he is a theoretical linguist, but the bulk of his research has concerned the history of ideas about language in the seventeenth century, on topics ranging from philosophical languages to linguistic eschatology. 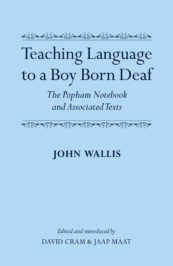 He is co-editor, with Jaap Maat, of George Dalgarno on Universal Language: The Art of Signs (1661), The Deaf and Dumb Man's Tutor (1680), The Unpublished Papers (OUP, 2001), and Teaching Language to a Boy Born Deaf: The Popham Notebook and Associated Texts.